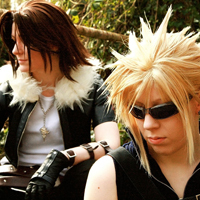 The first costume with Roxas' new wig |D The idea came from us and we wore these costumes with the whole group including Riku, Xaldin and Kairi. It was a lot of fun to design Axel's 'Ingame' outfit for drives. 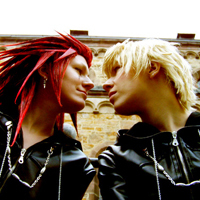 Kingdom Hearts 2 - Axel and Roxas (Home) As we were totally into roleplaying and designing KHII styled clothes we made some nice hoodies and cuddly and sweet home shootings! 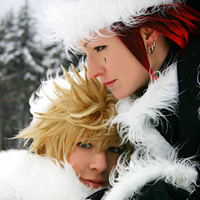 Togainu no Chi - Akira & Shiki Akiraaaawwwrrr~ & the holy St. Shiki! Togainu no Chi is one of the better shounen-ai animes with actual plot! It's a huge plus for it.